Today is my son Jeffrey's birthday #26. Happy Birthday! He was born in Provo on St. Lucia's day in Sweden which is a celebration held every year: December 13th was also the Winter Solstice, the shortest day of the year, in the old 'Julian' Calendar and a pagan festival of lights in Sweden was turned into St. Lucia's Day. 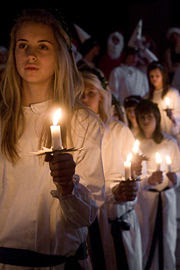 A national Lucia is also chosen. Lucias also visit hospitals and old people's homes singing a song about St Lucia and handing out 'Pepparkakor', ginger snap biscuits. In homes often the eldest girl plays St Lucia for her family, bringing them 'Lussekatts', St Lucia's day buns flavoured with saffron and dotted with raisins which are eaten for breakfast. Neat post, love all the info on the different custom and calendars. Lovely photo too. I'm sure electric candles are safer (good thing) but not prettier. This looks like such a beautiful custom. What an honor it must be to be chosen. We started a tradition several years ago of hosting a Lucia Day dinner for friends, several of whom have Scandinavian heritage, as do Tom and I. This morning we had to call our guests and postpone the dinner until Tuesday due to an expected sudden freeze this afternoon which will leave the wet, rainy streets icy. We are plunging into an arctic blast from the north which will be with us for a while. Thanks for this bit of history that takes me back to my own Swedish roots. What a beautiful celebration. I just read about this on Linda's blog and had not heard of it prior..where have I been living? I love so many of the Scandinavian customs... and food! This was a great read!